The White Streak did not wear white, nor did he have super-speed. Appearing in the back of the first issue of Target Comics in 1940, he was an ancient robot buried in a South American mountain for centuries, then discovered by a team of American archeologists and geologists! Identifying himself to them as "Manowar", the robot explained (in English) that he was created by the now-extinct civilization of Utopia and deliberately left buried until reactivated in a time of world-wide strife! Manowar was meant to be a peacekeeper, ending conflicts thru his amazing abilities including super-strength, invulnerability, and optical energy beams with the impact of cannon shells! He figured out how to disguse himself as human, and taking the name "Dan Sanders", Manowar joined the FBI (who apparently weren't big on background checks in those days.) and, using their information resources, battled spies and saboteurs who were trying to harm the still-pacifistic USA! 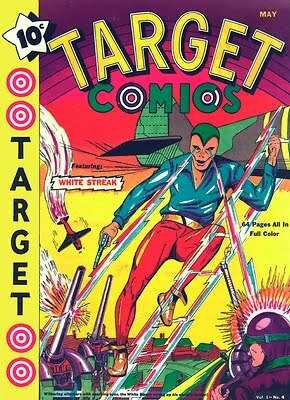 From the second issue until the introduction of Target & the Targeteers in #10, Manowar was the cover feature. After that, he went back to being a backup feature until America entered the war after Pearl Harbor was attacked in December 1941. The idea of a pacifist at such a time didn't seem viable, so the strip was dropped in favor of more aggressively-oriented characters. Trivia: White Streak was created by Carl Burgos, who seemed to specialize in creating robot / android heroes including Iron Skull, the Silver Age Captain Marvel (who said "Split" and sent various body parts off to operate independently), and, most famously, the Golden Age Human Torch! We, of course, found a place for such an offbeat character in the Solo Heroes section of Lost Heroes of the Golden Age of Comics™!